Family members of four black men and boys killed by police or security personnel joined tens of thousands of other people in U.S. cities Saturday in demonstrations of frustration over perceived police brutality and racial injustice and of determination to correct those flaws. In Washington, relatives of Michael Brown, Eric Garner, Tamir Rice and Trayvon Martin gathered at Freedom Plaza, near the White House, before peacefully participating with thousands of others in the "Justice for All" march down Pennsylvania Avenue to the Capitol. 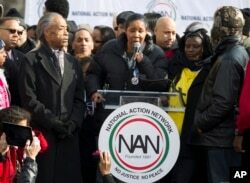 The Reverend Al Sharpton, left, listens as Eric Garner's widow Esaw speaks during a demonstration at Freedom Plaza in Washington, Dec. 13, 2014. "I am here not only for marching for Eric Garner, but for everyone's daughters and sons and nieces and nephews and dads and moms," said Esaw Garner, his widow. Eric Garner died after he was put in a chokehold by police officers in Staten Island, New York, for allegedly selling untaxed cigarettes. His widow spoke before a crowd — of various hues and ages — carrying signs bearing such statements as "I can't breathe" and chanting "Black lives matter." The demonstration was part of a planned National Day of Resistance, organized by the group Ferguson Action. It came in the wake of Garner's July death and Brown’s August shooting death by white Police Officer Darren Wilson in Ferguson, Missouri. In both cases, grand juries recently decided not to indict the officers. A protester displays a sign carried during the "Justice for All" march in Washington, Dec. 13, 2014. The case of Rice, a 12-year-old boy shot and killed by an Ohio police officer after waving what turned out to be a toy gun, has also stoked tensions. And the 2012 shooting death of Martin, 17, by a Hispanic neighborhood watch volunteer in Florida remains fresh in many Americans' minds. Saturday's Washington march was organized by the Reverend Al Sharpton, leader of the National Action Network and a host for the MSNBC television channel. Sharpton called for a united effort to hold the justice system accountable. "This is not a black march or a white march," Sharpton said. "This is an American march so the rights of all Americans are protected. I’m inspired when I see white kids holding up signs saying ‘Black lives matter.' "
Thousands took part in the march down Pennsylvania Avenue toward the Capitol in Washington, Dec. 13, 2014. The national march ended with a call for national reform on how police are investigated and how they use force against suspects. "We demand Congress pass a racial profiling act," the AFP news service reported Laura Murphy, head of the American Civil Liberties Union's legislative office in Washington, as saying. A larger demonstration took place in New York, where tens of thousands joined an event termed the "Millions March." Other marches and rallies occurred across the country — in Boston, Chicago and San Francisco, in the Southern state of Mississippi, and on the campus of Indiana University in the Midwest. A demonstration also was planned in the Canadian city of Toronto, Ontario.